Good Morning! Happy Tuesday. I'm going to make this post short and sweet because it's actually Monday night and I'm so tired, I'm going to go to bed early. I think like I'm getting a chest cold, too. Not good. I'm moving in a few days. I can hardly wait for this move to be over - I have been so stressed out that I can't function! Eeeuuuww.... I hate feeling like this. Anyway, here's my card. The photo is horrible. My craft room got packed up so that means all my half way decent lighting and home-made studio box was put away. I'm so sorry about the picture quality. 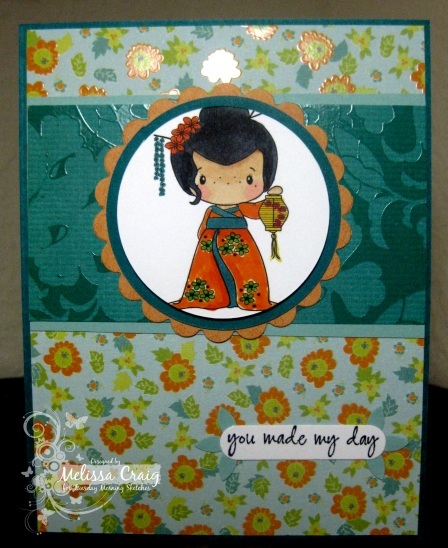 My features Sugarplum Geisha Girl (digi), Mediterranean Cafe mat stack papers and a sentiment from Mixed Messages by AmyR. 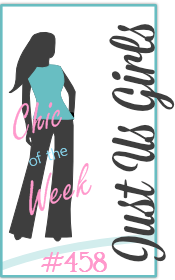 Have a great Tuesday and please head on over to the TMS blog - the girls did a great job, as always! Good Morning! 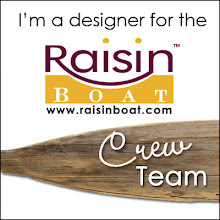 I am actually late getting this post together, I'm here at work doing it. Yesterday was so busy with packing up the apartment that last night I completely forgot. Yikes! But we made excellent progress. Most of it is done. My craft area is all packed up. All that's really left to do is day-to-day items that can't be done until we're leaving. 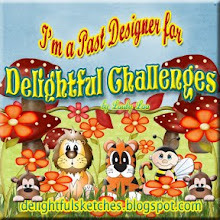 This week's challenge for The Pink Elephant is a sketch. Now, like I said, I'm at work so I don't have the sketch and I don't have the links. So sorry, but TPE is linked in my sidebar. OK friends, I just discovered that I can't add a photo from the work computer - it's blocked. I'll be back tonight to fix this up. 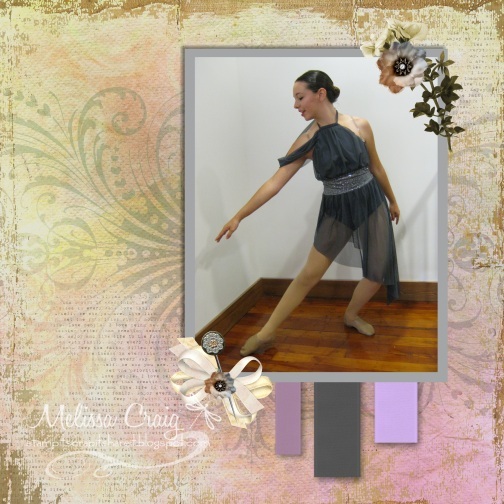 This is my beautiful daughter on dance recital picture day. Obviously this is not the professional picture, but I think it turned out OK and my daughter is gorgeous so this works for me. And the MyMemories Suite software made this page so easy to put together. I think I got stunning results and it only took me a few minutes to get it put together. Good Morning! Happy Tuesday. I'm gonna make my post short and sweet. 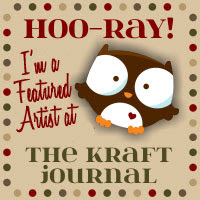 The sketch is up at TMS and we have a great sponsor, Paper Pretties! 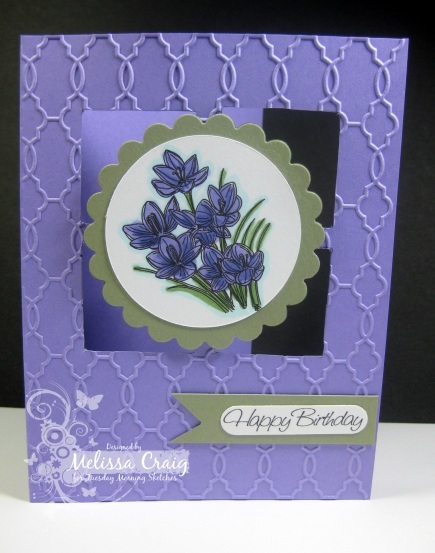 I created my card with aperatures and I'm featuring the image from Crocuses set and a birthday sentiment that I'm not sure which set it came from, but it's Paper Pretties, nonetheless. I love this embossing folder I bought for myself for Mother's Day! It has such a beautiful texture. Have a great day and we'll see you at TMS. Quick post here because it's actually Monday night and I want to spend the next couple of hours with my Mom. She leaves tomorrow while I am at work. Happy thoughts to my mommy for a safe flight. Isn't this fun? And so guy-ish! And the reason being is because it's the Judged Challenge week and the twist is Masculine. This works right? Hello everyone! I hope your Monday is off to a great start after having a fabulous weekend. My weekend was uber busy with recital. Hollyanne danced beautifully as did all the other girls. She looked fabulous as did all the other girls. And I worked my bahooty off during the first two shows. I dressed little girls, I escorted little girls to the theater to do their performance and did a lot of running and up down up down. So last night after we got home from the last performance my knee did something wacky and hasn't stopped popping with every step. I'm exhausted, my knee is swollen but it's all worth it! Tough challenge for me since I personally do not have a Dad to honor. My real Dad has been out of the picture since I was a baby only making a brief appearance sporadically throughout my life, my other Dad died 18 years ago and I already did a page on him and my kids' Dad.... well, ugh, is about the best I can say. So I was going to opt out of this challenge but then it hit me, why not do a page on a Father who is a wonderful man, loves his kids and is just one of my favorite people in the whole wide world. My cousin, Christopher. 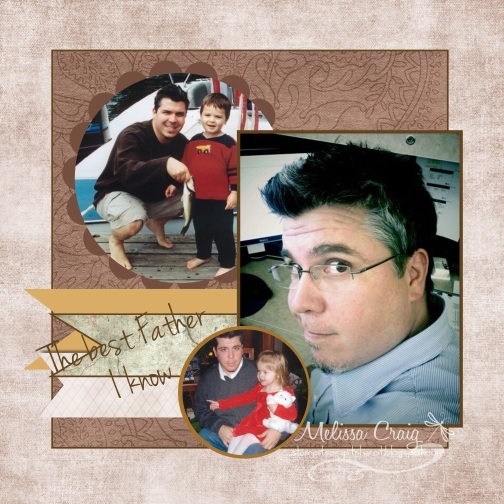 I swiped these pictures of him and his kids when they were really little out of his Facebook album and created this page using the sketch from The Deconstructed Sketch. 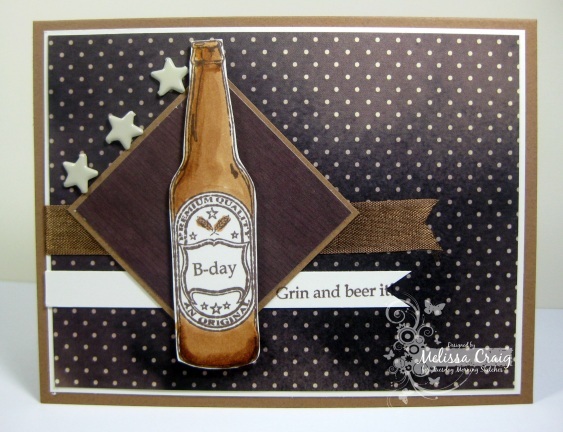 The sketch challenge is meant for a card, but hey, in my opinion cards are just mini scrapbook pages anyway. Please join us at The Pink Elephant and play along! Good Morning. Happy Tuesday! 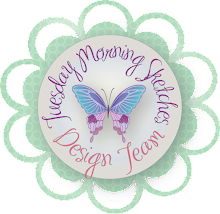 It's time for another sketch challenge at Tuesday Morning Sketches and this week we're sponsoring by a favorite of mine.... Sweet 'n Sassy Stamps. 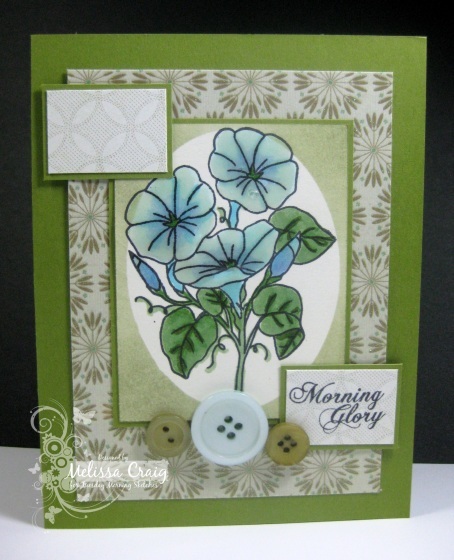 I am featuring the Morning Glories stamp set. I love how my card turned out, this color combo has to be one of my favorites. I was going to use my prismacolor pencils but I'm nearly out of odorless mineral spirits and for the life of me I cannot find my full bottle of more. I'm not sure that I really like using Copics on Very Vanilla card stock. The slick surface of the card stock makes blending look a little blotchy. So my son said it needed to shine. You can't see it in this photo, but I did cover the flowers with diamond glaze. Then I cut an oval out of a sticky note and covered the flowers so I can sponge around it. I hope that you head on over to TMS to play along with us. Good Morning! I hope you all had a great weekend. Mine was pretty good. The kids, Mom and I went to the beach. It was really nice - overcast and windy, but it wasn't hot. Got a bit sunburned, I honestly don't think there's such a thing as sunblock. And then Sunday I spent the day in my pajamas - I felt like such a slug, but I think I really needed the downtime. Good thing I had this page done last week when I was showing my Mom how to use the MyMemories Suite software. 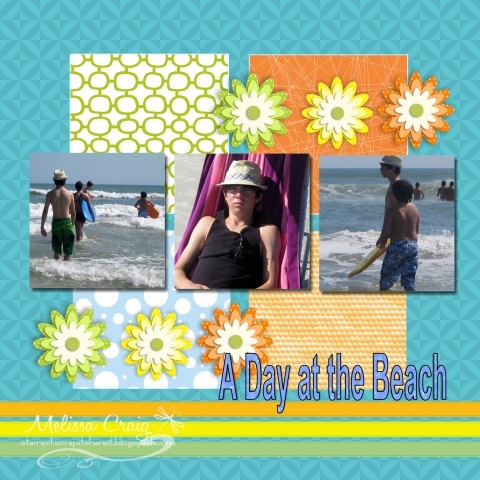 These beach pictures were from a few years ago but they worked great for this page. I didn't take any pictures of Saturday's outing. I followed a sketch from somebody's challenge but darned if I can remember who. Well, head on over to TPE to play along with us!